I stink at playing with Star Wars action figures. 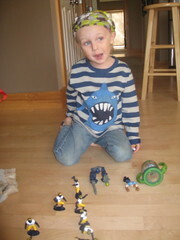 I stink even more at creating battles with little green army dudes, or constructing worlds of Lego Bionicles. In short, my kids are beginning to think I’ve lost the ability to live in their world of play-ala-plastic. “I want you to go play,” I say sternly, each time I hear the deep I-am-soooo-bored sighs come from either of the boys. “We want you to play too, mom,” Noah inevitably responds, his big blue eyes glancing over to whatever pile of cars/legos/action figures they complied. Recently, after a round of “go play/come with us” that produced frustrations aplenty, Max began to get teary. “You aren’t much fun anymore, mama,” he said, hanging his head for dramatic effect. I wanted to shrug off his pouting. I wanted to tell myself that wasn’t the case. I wanted to say I remembered how to play. But I couldn’t. I still had no interest in digging through the most recent mound of plastic junk the kids had fallen into favor with, nor did I want to build a Lego castle or fortress or mini figure village. I know I should….but honestly, I can’t make myself pretend that’s fun– and kids know when you fake play. In some ways, that may be worse than not attempting to play at all. So instead of a forced 15 minutes of talking in a robot voice while destroying some town that I can hardly pronounce (compliments of the Bionicle craze), I walked up the stairs into Max’s room. Ignoring the running commentary he continued to offer, I schlepped the basket down the stairs and out the backdoor. “What are you doing?” Max giggled as I flipped the basket’s contents out onto the grass. 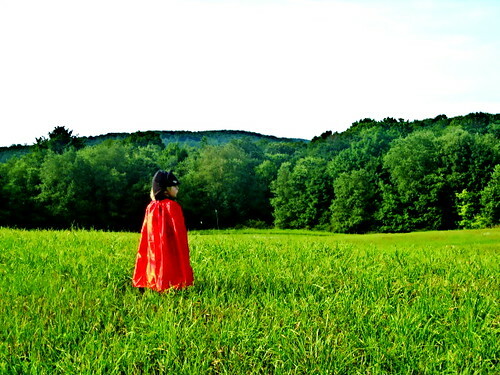 I threw on a red hooded cape, and dug out a crown. I tossed Noah sword and shield. We put a peapod outfit on Lizzie. Soon, Max was donning a batman mask and superhero cape. And we found ourselves traipsing down the path into the fields—the magical, alternate universe (think Harry Potter meets Narnia meets Beatrix Potter) behind our house. It made me realize that being outdoors, exploring and imagining and partaking in unstructured play is not only good for our children. It brings a kind of re-charge to our parenting souls, creates this connection to our own youths, our own days of fort building (with sticks, not plastic), fairy hunting and superhero adventuring. 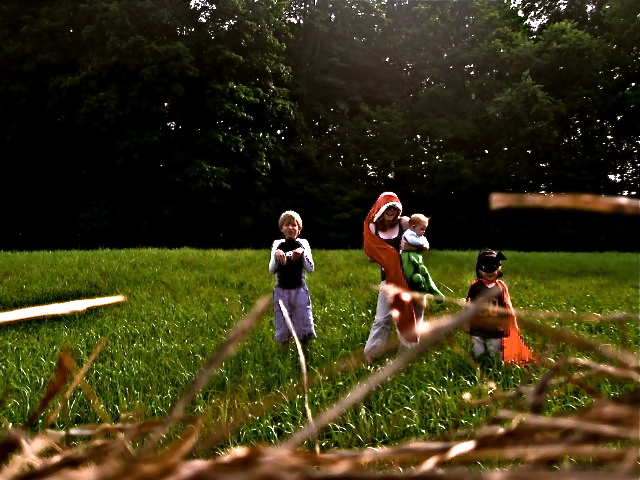 In what ways to you play with your kids in the great outdoors? Do you know of places that seem so magical, so full of natural wonder, that you still feel called to let go…and just play? Every time I see a tall pine tree with branches still reaching to the ground, I remember when we trimmed the inside dead branches and created the perfect escape. The fallen needles provided the carpeting. The branches formed the perfect fort, tee pee, castle…your choice. It’s magical. Great post, you sound like a wonderful mother. Your kids are lucky to have someone to play with them as much as you do. They will remeber those times their whole life. Many parents today would rather stick the kids in front of the TV and have that entertain them instead of spending time with them, that is sad. Making an effort to play and encourage them using their imagination is great for them. my wife keeps bugging me to build a tree fort for the kids to play in, I’m going to have to give in soon before they head off to college. the hills and valleys were alive with magic when you escaped with your children into that magical place so often forgotten by adults. A day they will always remember! Your writing is as wonderful as your parenting skills. Never lose that ablility to play. Thanks for the kick in the buttreminder, Kate. Like the picture of the view you posted last week, it makes me remember why I always wanted to raise my kids, like I was raised, in the country. We had mud-and-stick forts, complete with stairs carved out of the banks of the pond, and Molly Whuppie bridges (do you know that old fairy tale)? Am still trying to figure out how to recreate those experiences for my kids in town. I love when your imaginative juices are flowing. One of my favorites is when the boys built a fort for you to eat lunch in with them just after Lizzie was born! Then you were wild animals and Max was trying to kill the wild animals, but Noah said lets save them instead!! !